Q-SYS Designer Software is the most powerful yet simple advanced DSP software on the market today. This software enables the user to create designs for the Q-SYS Integrated System Platform. The system design environment was created specifically to be intuitive and easy to use. It is laid out without clutter or complicated multi-level menus. As a result, the software allows system integrators to focus their energy on building the audio system, rather than laboring over a complex software learning curve. • One Software for all System Sizes: Q-SYS Designer Software is a single application for use with every Q-SYS Core category for projects of any size. • Emulation Mode: Build the majority of your system without hardware. • Third-party peripheral support: Q-SYS allows for control of external devices through available LUA scripting. • User Control Interfaces: Design custom buttons, import graphics, and build user controls for touchscreen controllers. Note: Before upgrading, be sure to create backup copies of your Q-SYS design files for the current version and older versions. Also, make backup files for all media you have on the Core. To avoid overwriting your backup copies, be sure you do not open the backup copies with the newly installed version of Q-SYS Designer Software. New browser-based Core management tool with several tools migrated from Q-SYS Administrator and Configurator. 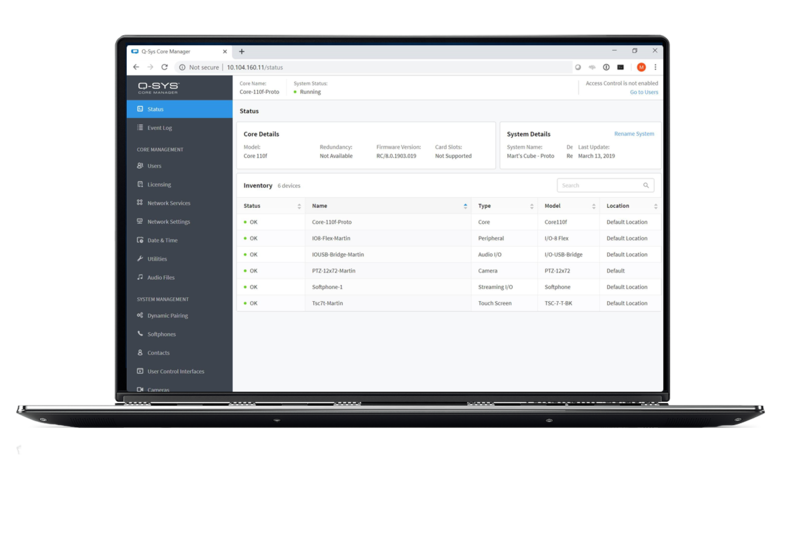 Additionally, Core Manager lays the groundwork for Q-SYS Reflect Enterprise Manager, a cloud-based monitoring and management tool that will follow later in 2019. * Requires license activation to deploy a design with custom UCI onto a Q-SYS Core processor. Visit the Q-SYS UCI Editor product page for licensing details. Q-SYS offers a full-featured AV control platform, powered by its robust software-based scripting engine, including third party control plugins and a new visual coding tool that allows for easy drag-and-drop control scripts composition within Q-SYS Designer Software. * Requires license activation to deploy a design with plugins & scripting elements onto a Q-SYS Core processor. 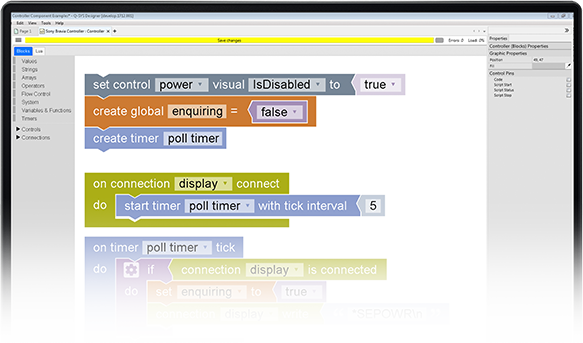 Visit the Q-SYS Scripting Engine product page for licensing details. Q-SYS Designer Software v8.0 introduces major changes, including functionality migrations from Administrator/Configurator to the new Q-SYS Core Manager tool, along with several other changes. Please read this document before updating your Q-SYS system! NOTE: For cinema-specific instructions on Q-SYS installs, please visit the Cinema Q-SYS Designer Software page. Please fill out the form to start your download. Thank you. Your download should begin shortly. Click here to download manually. QSC has partnered with several AV&C technology manufacturers to provide a broad portfolio of prebuilt plugins. This makes integration of third-party devices into a Q-SYS system a simple drag-and-drop configuration. 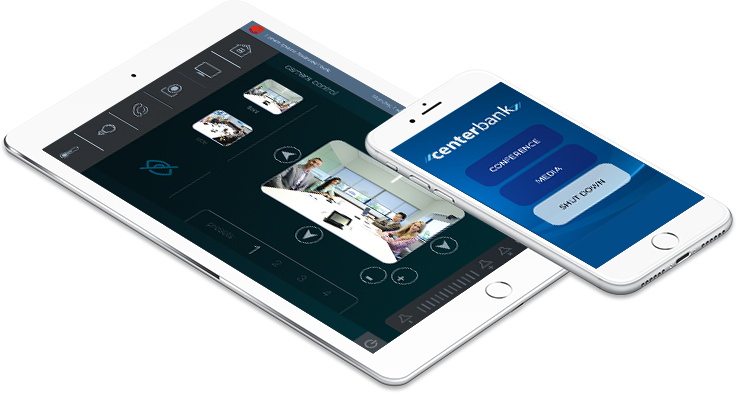 Design user control interfaces for your iOS device within Q-SYS Designer Software and use this free app to wirelessly control any element of your Q-SYS system from your iPhone or iPad. If you have a need for an advanced script or feature for your next installation, check out our list of approved independent Q-SYS Programmers. The Q-SYS online help file is the most complete and latest help file for Q-SYS Designer Software and associated hardware and peripherals. You can access this help file from within Q-SYS Designer Software. The Q-SYS online help file is usually updated more frequently than the help file built into Q-SYS Designer Software.